Videographer Steve Powers from Montana’s historic Bitterroot Valley has put together an astounding set of DVDs intended to both inform and enable hunters improve their ability to achieve success in the field while enjoying the drama of the hunt – wherever you hunt and whatever you pursue. They serve as a guide to picking an outfitter, to doing research for special permit areas in the western U.S. and non-guided hunts in general, and how to get started in shed antler hunting. Footage depicts a wide variety of outfitted, non-guided and special draw unit hunts in a wide range of places. 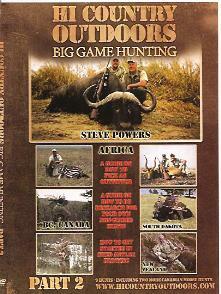 Part 2 depicts nine hunts for cape buffalo, zebra and other spcies in Africa, moose in British Columbia, American bison in South Dakota, and elk in New Zealand.